When she was acquitted there were violent protests from Islamists. Thus, the government barred her from leaving the country. Her husband made many pleas for asylum explaining they were in great danger in Pakistan. The order to release her had been sent to the prison in the city of Multan, where she was being held. 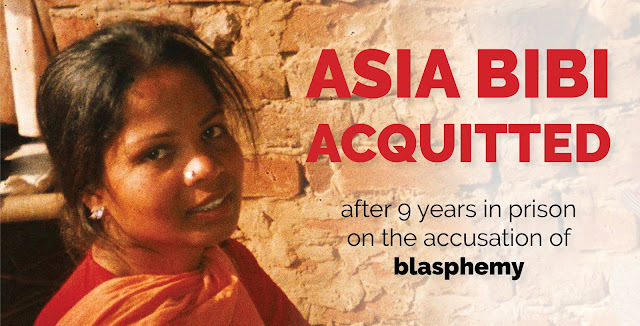 Asia Bibi, also known as Asia Noreen, was convicted in 2010 of insulting the Prophet Muhammad during a row with neighbours. According to reports several countries have offered her asylum. Pakistan's Information Minister Fawad Chaudry told the BBC that security has been "beefed up". Antonio Tajani, president of the European Parliament, confirmed that Bibi was released from prison, saying he waits her in Europe. #AsiaBibi has left the prison and has been transferred to a safe place! I thank the Pakistani authorities. I look forward meeting her and her family, in the European Parliament as soon as possible.